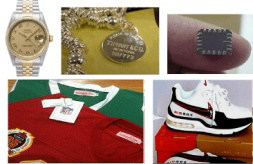 US Homeland Security (DHS) required a way of detecting counterfeit commodity goods that are visually identical to the authentic goods. Counterfeiting of goods effects US National Security, US Corporations, and every US citizen by erosion of the US economy. Based on an analysis of above objectives, our subject matter experts developed a new innovative detection means to differentiate a visibly identical counterfeit product from the authentic item through advanced materials analysis.